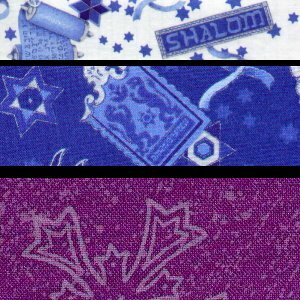 It was prior to Christmas 1996 when I saw the most gorgeous Hannakah fabric. It was two complimentary prints, essentially the reverse of each other. One was a white background with various Judaica objects in blue on it; the other was a blue background with the objects in a lighter blue. Accents were in metallic silver. I just had to make something with it. Luckily, Neil is Jewish and I knew she would love it. 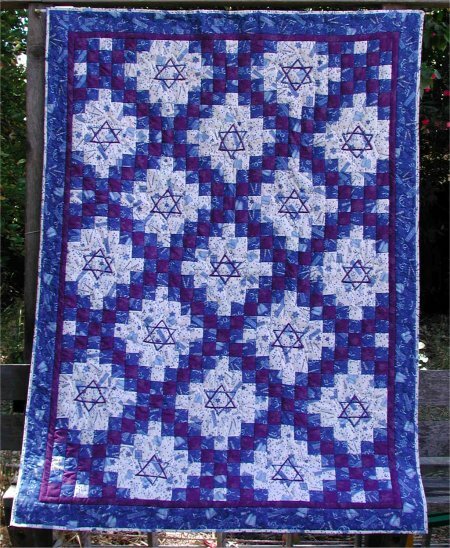 I paired the blue and white fabrics with a rich purple and made the quilt in the Irish Chain pattern. It's a "personal" size and I sewed a hanging sleeve on the reverse, so that if Neil wanted to actually use it as a wall-hanging, she could. Of course, this would entail her obtaining something to hang the quilt from and then performing the manual labor to secure the hardware to the wall ... this could be a major undertaking! [grin]. The backing is an outer-space motif to represent our comon interest in Space:Above and Beyond. Well, sometimes it takes me a while to figure out just exactly the right way to finish off a project. 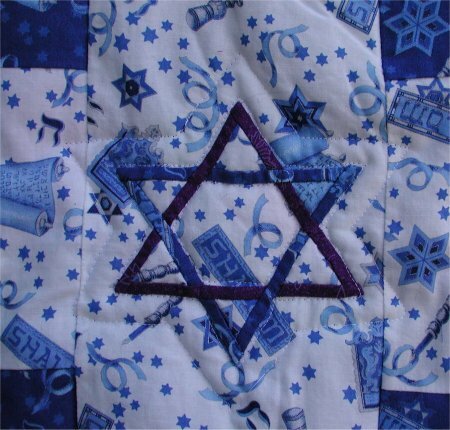 In the Spring of 2001, I was working on a Celtic knotwork quilting design and it hit me like a bolt from the blue .. omigosh .. Stars of David in Celtic knotwork! Why hadn't I thought of this before?? I made a sample using the leftover blue and purple fabric (see? it's a good thing to be a packrat!). The good news was that I really liked it. The bad new was that I had a very limited amout of the blue fabric left. When I told Neil that I had finally figured out what to do in the "empty" spaces of the Irish Chain, we arranged for me to visit her, at which time I told her that if she really prefered the quilt without the Stars of David, that was perfectly fine with be, as it was her quilt. (Parenthetically, if she didn't want the Stars of David, it would mean one less project for me!). 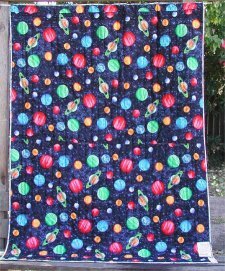 However, she did like them, so I bundled up the quilt and took it home with me.